Pak Mail Pittsburgh Crate & Ship is an authorized FedEx Shipcenter for Greater Pittsburgh, Eastern Ohio, Western Pennsylvania, West Virginia and surrounding areas. 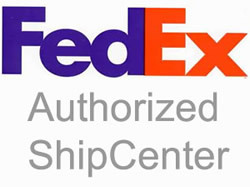 We are authorized to resell FedEx products and services, however, we do not handle the deliveries for FedEx. If you are trying to contact FedEx regarding a call slip you have received or to schedule a delivery, please call 1-800-463-3339.